I love Christmas, I do. I love almost everything about it. Whether that’s during the build-up to the big day itself, through my snow-delayed train to work and work’s night out, putting up decorations, the tree and even the shopping (well, as long as it’s not too busy) – to Christmas eve and day itself; from doing my last-minute wrapping the night before, to sitting down to our meal. I love it all and more. And this year my wee man, who isn’t two until April, will be a little older and really able to better understand more about what all the fuss is about. I don’t expect it to be an extravagant day but it will be warm, very tasty, really comfortable and relaxing. On Christmas Eve I’ll probably sip on a warming drink, reflecting on family passed away over the last year, all of whom have left a huge gap in my life; probably a few tears (my eyes welling even as I type); a few photos; and definitely a few smiles. I’ll raise a wee toast and wonder where the time has gone and ponder. Then, I’ll look to the future and more immediately, with excitement to the the big day. You may have a similar experience, maybe not – but chances are you like me will have some lovely plans. Not everyone however is so lucky to be able to reflect so favourably on life, and to do so in such a warm and safe environment. That is why once I’d read Ross McCulloch’s blog post ‘Oi Twitter – Lets all be a #SocialMediaSanta‘ I knew I needed to act. It just seemed so simple I couldn’t find a reason not to. Go visit, have a read and come back and all will become clear. You might not even want or need to come back! 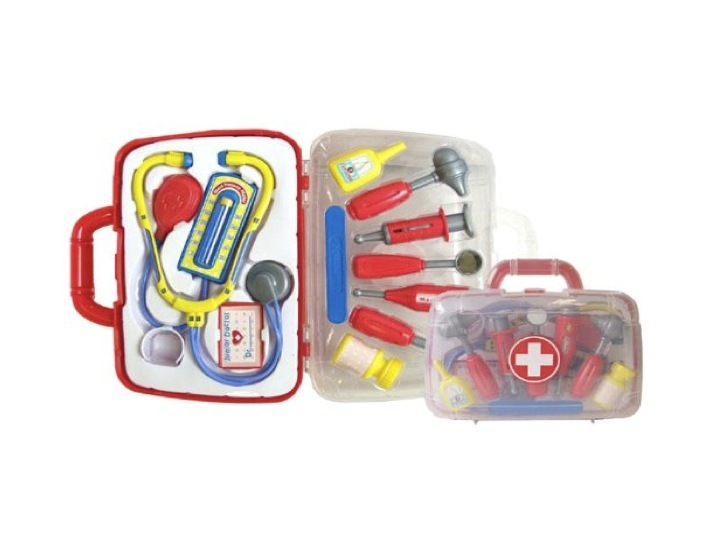 It certainly made me think and act: so much so that I’ve just bought a kid’s toy Medical Carrycase from Amazon, pictured, that will I hope be offered to a child to help their Christmas be that little bit more special than it otherwise might have been. It is just a small contribution and maybe not an obvious toy to buy a kid but I’m a bloke doing some ‘unsupervised’ shopping. Dangerous. Oh, and I also had logic: firstly, as an NHS Communications Manager, maybe this could plant a seed for an inspired child to one day go on to a career in healthcare; or perhaps for a hospital visit it might help to become more accustomed to and familiar with some of the clinicians’ medical equipment. Or maybe it will just be a fun set of toys to play with. Whichever, what is certain is that even such a seemingly small gesture can make a big difference to a child’s life, especially to those who are vulnerable or face challenging circumstances, which can be acutely felt especially at this time of year. That isn’t the only story here. What is pretty awesome is how my small contribution came about. I read Ross’s blog post challenge, an old one at that from last month, on my daily commute back from Edinburgh to Dundee today as a result of Shelter Scotland tweeting it. If the blog post didn’t exist would I have discovered this local Lanarkshire initiative at all from deepest Dundee? If I hadn’t been following Shelter Scotland on Twitter would I have even read Ross’s blog post? Even if I had been made aware of the initiative I’m not sure it would have been so straight-forward to contribute as it ultimately was: I simply added the tweet as a favourite, logged on to Amazon when home (ha – believe it or not also a first, I kid you not) and within minutes had bought my present and arranged for it to be dispatched to Blantyre. It is also my first Christmas present that I’ve purchased for this year. Radical I know, but is it just me who finds that an incredible series of events? I hope not. That is AWESOME. And if you think so too then do visit www.rossmcculloch.com/oi-twitter-lets-all-be-a-socialmediasanta to find out how. I’m many things to many people. A son, brother, nephew, grandson; a neighbour, a buddy, a commuter companion; some say a pain others say a great guy; a colleague, friend, professional; a pedant, an expert; and a Daddy. Maybe even a mistletoe kisser. And now, for sure, a Social Media Santa. Brilliant gift Kenny! Fingers crossed even more people read about #socialmediasanta now you’ve taken the time to blog and the Blantyre project get even more toys. What an amazing gift Kenny! Thank you for the blog post, your gift and for your support! We’re just amazed at how generous our followers are. #socialmediasanta ftw! Thank you both for your comments and great to observe so much interest in this topic: I’ve posted a blog alert through LinkedIn a couple of times, tweeted a few times and had a few RTs so hopefully there will be more to come. Great to meet the Shelter Scotland Comms crew at last night’s CIPR PRide Awards too, fab to put voices to faces!